As Bil Herd told me, "It was a very special night... very rare...", the night of the 25th Anniversary of the Commodore 64 at the Computer History Museum, Mountain View, California, in 2007. Jack Tramiel, CBM founder, was there, making a rare public appearance. And I always thought that there would be another night with Jack in the future. Jack passed away on Sunday, April 8. 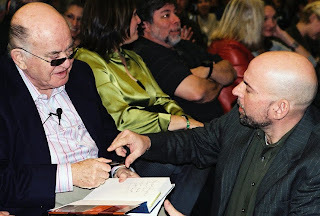 In the above photo, Jack (left) autographs the On the Edge book for Bil Herd. RIP, and thanks for all, Jack; including introducing me to the world of computers with the C64, and my still-existing hobby about 8 bit computers.